Local digital marketing experts with website cyber security services included. Experts in getting local businesses to page 1 on Google. Affordable page 1 promotion on Google. Local & mobile search engine marketing. Google searches for local companies now replace yellow pages. Improve your business brand online. Is your business invisible online? Free Website review. We will happily evaluate your existing online presence. 74&percnt; of Internet users do local search for products and services they need. 82% of them take an “offline action” - like call the business or visit the shop and purchase. Let's get you seen in front of these customers? Local and Mobile Search Engine Marketing. 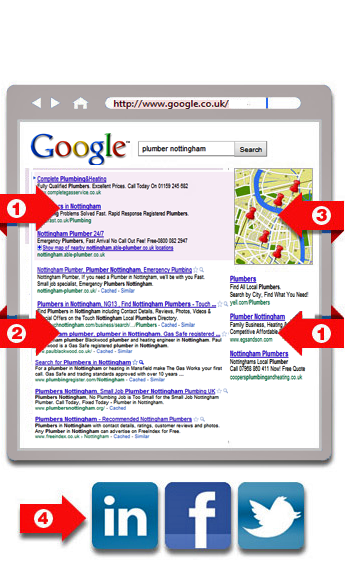 Get your business on Google Page 1 with accurate contact details. Getting on page 1 will help you start to get recognition from Google but with a focus on attracting customers in the geographical area that you operate in. The process involves optimising your current website, using a combination of on-site and off-site factors. Primarily, involved is editing the site's content and coding to increase its relevance to keywords that you want to rank for and to remove barriers to the indexing activities of search engines. We focus on optimising your web pages to appear for products and services that are in your locality or town, effectively replacing Yellow Pages as a way for customers to look you up. Local & Mobile search engine marketing focusing solely on optimising at a local level, rather than nationally. So a potential customer would type in a keyword / search query into a search engine which was related to your services and a location near to them. If you were a Plumber based in Nottingham and your website was visible to the customer in this example there is a good chance this would result in an enquiry for your services. We manage your AdWords account so that you get the most clicks for the least amount of money using Google's pay-per-click system. Your business can also get seen on popular local websites. 2 - Organic Search Results. Optimising your website to secure the listings that are gained via onsite and link building work. Google's local map listing feature has recently been updated which has resulted in helping smaller business appear in Google. Advice on how to utilise popular social sites such as Facebook, LinkedIn and Twitter, to help maximise and legitimise your brand locally. 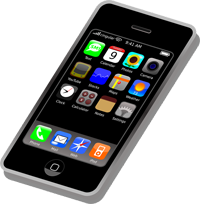 Google knows that a growing number of people are performing searches through their mobile devices. Most of these searches are for LOCAL services or information and Google gives them one-click access to make a phone call, see a map or get directions - TO YOU! Everybody knows that reviews and ratings make a big difference in what people buy. The same thing is true about your business - positive online reviews improve your reputation and online exposure. But it can be hard getting good, honest customers to fill out reviews. We make it easy for them and for you. 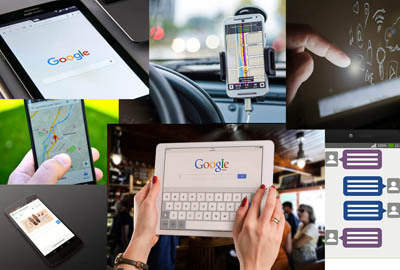 More than 100 million people a month use Google from mobile phones to find directions and information. That's the perfect opportunity to have a customer find you -- when they are ready to take action! Mobile puts your services right in their hands. We handle all the technical stuff for your local listings on THREE major search engines -- taking care of all the details that help get you to the top. We can also help you with attention-grabbers like mobile coupons, social media and more! Hacker Radar: Protect, Detect and Respond. Defend your customer's sensitive information. Don't lose out on business with your website down. Managed website cyber security service. For all website types and platforms. We help you meet your industry security compliance regulations. Advice & updates on cyber security news impacting your industry. Your information security partner. Website security hardening / Website configuration review. Instructions for any external providers. Identify weaknesses in the security of your website's sensitive information. Website security monitoring & detection. UK Incident response & Customer support via phone/ email. Talk to a real person. We will fix and clean your hacked website. Get back online fast if your site has been hacked. Fix hacked site and secure vulnerability. Remove website malware, infections & defacements. Google blacklist & warning removal.